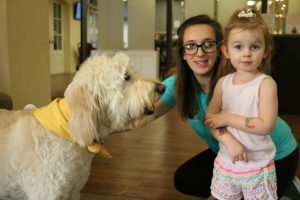 Lilly and Toni relax with a Hand in Paw therapy dog. This summer, we’re honored to share the story of two sisters, Lilly and Lyla, as told by their mother, Toni. 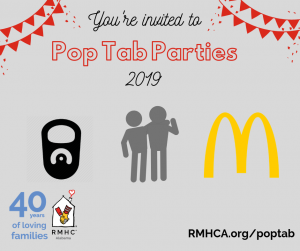 Staying at RMHCA has been wonderful. It allows us to be close to our infant, Lyla, whom is being cared for at Children’s of Alabama. It saves us from spending money on a place to stay, such as a hotel, or constantly make the drive back and forth from our home in Huntsville. RMHCA also gives us the convenience of being so close to the hospital that we can walk over to be with Lyla any time we want or need too. It also helps with the expenses of groceries since volunteers often provide daily meals. The Ronald McDonald House is a great place for siblings, unlike other places where they would be confined, like a hotel room. They have each other and other children at the House to play with and it gives them a distraction from having to adjust to a different routine, whether it be short-term or long-term. It is the small things that can make anyone’s day a little bit brighter. Every morning that my other daughter, Lilly, comes down the elevator, the staff at the front desk is always ready with hugs and excitement to see her. And big sister Lilly loves sitting in the window at the House, looking at the hospital where she knows her sister is staying. 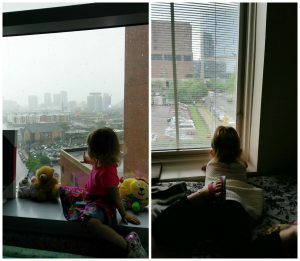 She also enjoys seeing the House from baby sister’s hospital room. RMHCA has been such a blessing to our family through this unexpected and tough time. It is a great feeling knowing there are people willing to share their helping hand with those at the House who are going through hard times. This place has been outstanding and we will definitely have to come back to visit. We are so thankful for every small thing! We hope you enjoyed reading about Lilly, Lyla and Toni. We need your help today to continue keeping families like them close. There are many opportunities to support us by making a financial donation or volunteering. Volunteer opportunities include providing meals, packing grab and go snack bags for the families heading to the hospital, organizing a Wish List Drive at your office or church and even shopping for us on Amazon Smile! Thank you for your support!